Holly and I have both been pig hunting lately, so, for the first time in a while, we have lots of pork around the house. Mostly I cure the meat in various ways and make lots of fresh sausages, but the backstrap, tenderloin and other tender cuts usually get cooked simply. This is one of those ways. It’s a pork cutlet recipe called ginger pork, shogayaki in Japanese. It requires only a few ingredients that are now in pretty much every supermarket, and comes together in a flash. More or less, this is a Japanese take on German jägerschnitzel. 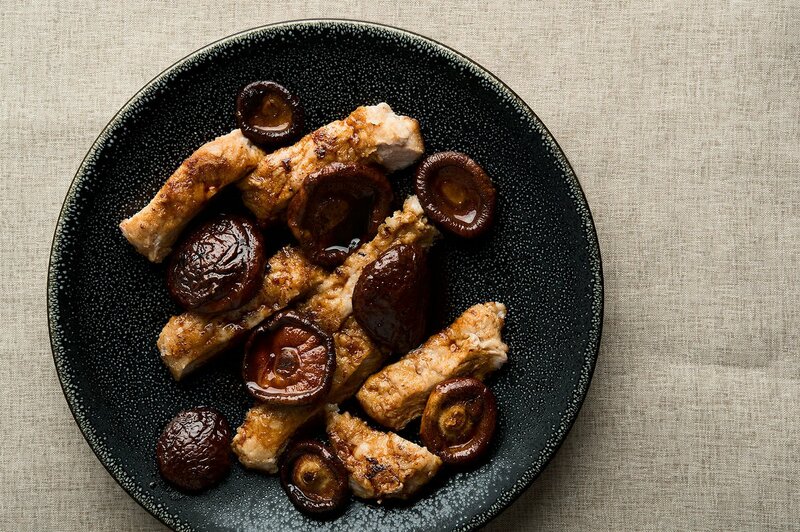 Pork loin, pounded thin, seared in oil, then doused in a sauce with mushrooms. You can either leave the pork unadorned or dust it in a little rice flour, which is what I do. The only tricky part to this recipe is getting the ginger juice. Traditionally, you’d use a porcelain ginger grater, but you can also use something like a microplane grater, or do what I do and use a sturdy garlic press. I like a full 3 tablespoons of ginger juice in here, but if you’re not a fan of, say, those spicy ginger beers, stick to 1 or 2 tablespoons. The rest of the sauce is a bit like teriyaki, only there’s no sugar. It’s a fantastic, simple and fast meal to put together on a weeknight. Serve this with Japanese-style rice and maybe a cucumber salad like this one from my friend Elise at Simply Recipes. I use loin meat from a wild hog here, but obviously store-bought pork is fine, too. Chicken, pheasant, grouse or turkey breast is another good option. 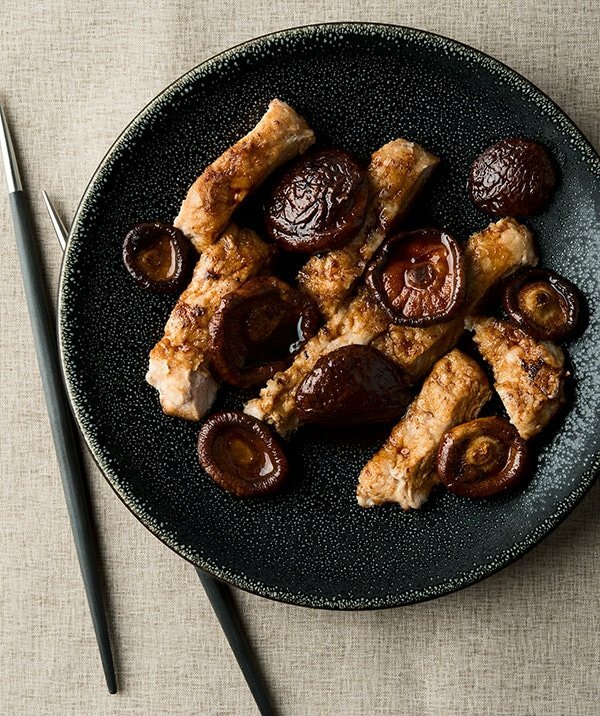 I like shiitake mushrooms, but you can use any meaty mushroom, wild or store-bought. Slice the ginger into pieces that will fit into a garlic press and squeeze out the juices until you get to 2 to 3 tablespoons. Alternately, you can extract the juices with a microplane grater or Japanese ginger grater. Slice the pork loin against the grain into medallions. Put the medallions between two pieces of plastic wrap, and, using a rubber mallet, meat mallet or empty wine bottle, pound the cutlets to about 1/4 inch thick. Salt them. Salt the cutlets, then dust them in the rice flour. Set aside. Heat the oil in a frying pan over medium-high heat and saute the pork loins. Sear for 2 minutes on the first side, then turn and lower the heat to medium and finish cooking to your liking, generally another 2 to 4 minutes. 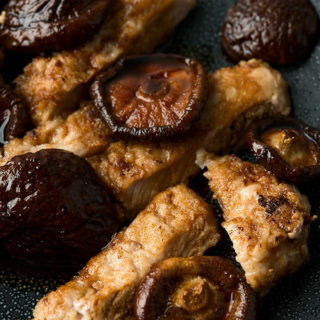 Remove the cutlets and put them in an oven set to "warm." Add the sake, mirin, soy sauce and ginger juice to the frying pan and bring to a boil. Add the mushrooms and boil furiously for 4 minutes. Turn off the heat. Take the pork cutlets out and slice them, giving everyone some. Pour the sauce and mushrooms over the pork and serve.